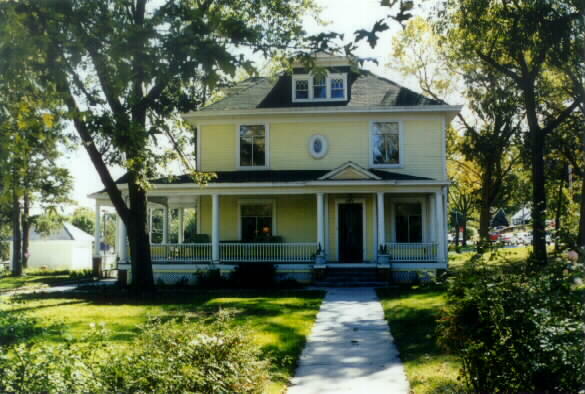 The Keirle House is located at 3017 Mormon Street in the Florence neighborhood of North Omaha, Nebraska. Built in 1905 in the classic box style popular in the Midwest, the Keirle House was designated an Omaha Landmark in 1997. The Keirle House was built by the founder and owner of the Keirle Ice Company, which cut its ice from the Florence Water Works and shipped them across the Midwest for top price. Its four bedrooms occupy a small estate in the middle of Florence. The Florence Historical Foundation restored this house in 1996 after the death of Maude Keirle, the last member of the only family that ever lived there. Built with a variety of styles, the Keirle House is a Midwest "classic box" with Queen Anne and classical revival details. It was built to face the town square of Winter Quarters, which the Mormons originally laid out in 1846. Until February 2011, the House previously served as offices for the Uta Halee Girls Village executive offices. On November 9, 2011, Omaha's Landmarks Heritage Preservation Commission voted to delay a vote indefinitely on removing the House's historic landmark designation. The owners of the home had requested the designation be removed to ease the property's sale. On March 9, 2012, the Keirle House was purchased by Robert and Kristina Mitchell for the purchase price of $110,000. Robert and Kristina will use the house as their primary residence. The House remains on Omaha's Landmarks Heritage Preservation Commission registry. ^ a b c d "Keirle House". City of Omaha — Landmarks Heritage Preservation Commission. Retrieved 2012-10-25. ^ "Old House May Lose Landmark Tag". Omaha World-Herald Newspaper, Omaha, NE, USA. November 7, 2011. Archived from the original on January 30, 2013. Retrieved 10 November 2011. ^ "Florence Home Still A Landmark, For Now". The Omaha World-Herald Newspaper, Omaha, NE, USA. November 10, 2011. Modern photo of the Keirle House. This page was last edited on 9 May 2017, at 16:23 (UTC).